One of my favorite topics is classic muscle cars. As a sports car enthusiast I enjoy them all, but the body style I like the most is of the C2(1963 thru 1967) corvettes. The phrase “C2” simply means season two for the corvette body styles. A C1 corvette has a different body style than a C2. The same holds true with the others as well such as the C3, C4, C5, C6, and the new C7’s. For me though any C2 corvette would have sufficed as long as the VIN and Trim tags are original and there are no rust issues with the car. I just love the body style. This page features my 1965 corvette. Like many of the markings on the old firearms on this site, let's dissect this car and see if it’ll talk to us. Maybe it’ll tell us a story or two, or where it’s been, what has been changed, what’s original, and so on. No matter what we learn, good or bad, this car will be taken care of. I use the Corvette picture above on my ham radio QSL card. These QSL's have been sent around the world. Or stated another way, this 65 Corvette has been seen around the world. Some of the information found below would have been impossible to acquire without the help of former owners and for that I am deeply thankful. If you are a prior owner please me. I'd love to hear any stories or receive any information you may have about this corvette. It was born on Tuesday June 15, 1965(confirmed GM official production date) and was the 19,903 corvette made that year. If my math is correct, the car featured on this page is the 132,660th Corvette produced. The official Chevrolet production figures for 1965 originally indicated a total of 23,562 corvettes produced. However, in March of 1991, the records were corrected to include two additional corvettes built for a total of 23,564 corvettes produced in 1965. These last two cars were both convertible models and it should be noted that they were the only two corvettes built during the month of August in 1965. In September of 1965 the 1966 corvettes started rolling down the assembly line. The picture on the left is of the VIN(Vehicle Identification Number) tag. The VIN tag tells us several things about this particular Corvette. The VIN number is 194675S119903. 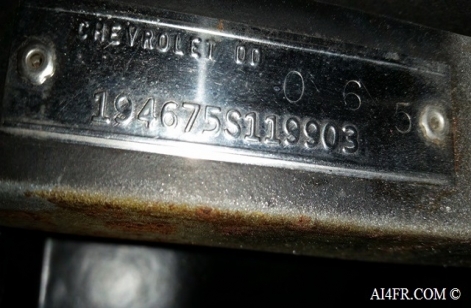 Also seen on the VIN tag is Chevrolet DD and a stamped number of 0 6 5. Below is a breakdown of what each of these markings on the VIN tag indicates. Also take notice that a different style of rivets have been used on each of the tags above. This VIN tag has the correct and original rosette rivets as well as being made from stainless steel. VIN tag also has 0 6 5 stamped on it. The 0 6 5 is the dealer delivery date which is 06(June) 5(1965). Dealers stamped the delivery dates on these tags when the cars were delivered to the original owners. 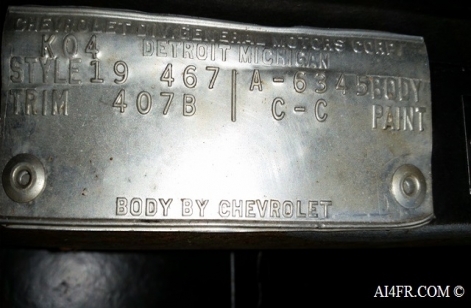 Some dealers stamped the delivery dates into the trim tags as they were made of soft aluminum and easier to stamp than the stainless steel VIN tags. While some dealers did not stamp them at all. A Louisville Chevrolet Zone Service Bulletin No: 22-59 dated May 20th 1964 reminds dealerships to stamp the delivery date on the serial number tag(VIN) due to the fact that "some owners are experiencing difficulty in securing warranty services from other than the selling dealer due to the delivery date not having been stamped on the vehicle Serial Number Plate." The picture on the right is of the TRIM tag. This tag describes how this particular Corvette left the assembly line. 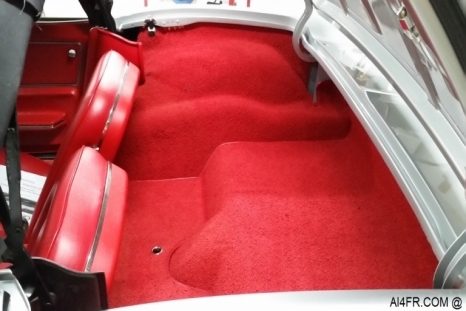 It shows the body paint color, type of interior and color of interior, whether the Corvette body was made by GM or A.O. Smith as well as the body serial number. Below is a breakdown of what each of these markings on the TRIM tag indicates. K04 = (K =June) (04 = 4th) This is the date of the body. 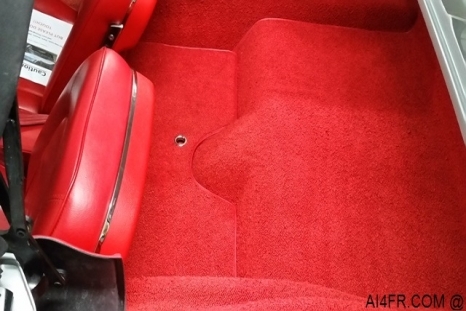 According to the 6th edition of the 1965 corvette technical information manual and judging guide: The trim tag was attached on the body assembly line and represents the date the body passed by that station; it may or may not represent the date a particular corvette reached final assembly. This Trim tag has the correct and original round rivets as well as being made from aluminum. The letter "B" next to the 407 in the trim stamp is the ECL or Exception Control Letter. The ECL codes delineate options within the same interior color such as power windows, AC, etc. A.O. Smith did not include the full ECL code for the bodies they produced. Some A.O. Smith bodies have no ECL code at all. 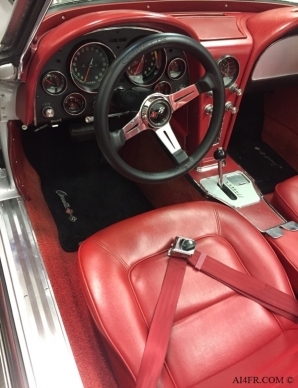 The pictures above are of the interior of this 1965 Corvette. 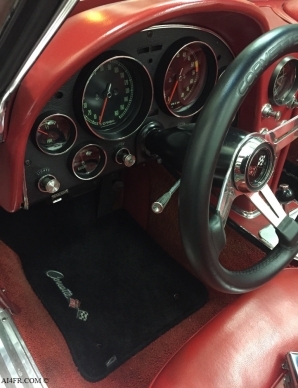 Anyone know the make and model of the steering wheel? I need a link or some type of documentation. The details of it are as follows: The back top of the bottom spoke states "Made in Italy", while on the bottom of this spoke is "07 99". The wheel is black with either polished aluminum or chrome spokes and has been embossed at the top with the word “corvette”. The stitching for the wheel cover comes together at the center of the bottom spoke. The cutouts in the spokes are of a cone(for lack of a better word) design. Whenever I find another wheel that is similar and can zoom in on the stitching I find it is different. 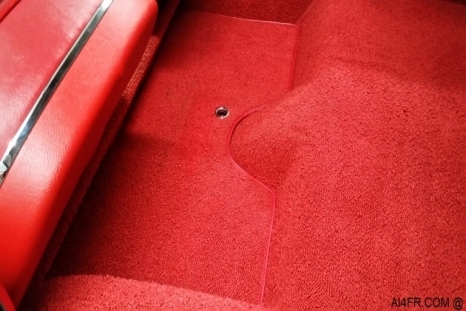 Continuing with the interior the four pictures above show the convertible top storage area. When the top is up this area can be used for luggage or other misc. items such as groceries. The compartment directly behind the rear seats is the jack storage area which can also accommodate a small tool box for emergency repairs. The picture on the bottom right shows the jack compartment with the cover removed. The pictures above are of the engine compartment. This engine was not born with the corvette. 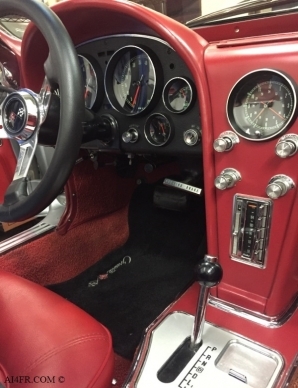 Below is some additional information concerning this particular 1965 Corvette. Engine casting 10243880 = 350 C.I., 4 bolt mains, crate engine. Engine GM Part number: 19210009 dated 12-11-2011 with Vortec iron heads . GM calls it the "350 HO Turn-Key". Engine specs: Chevy Small-Block V-8, Displacement (cu. in. ): 350, Bore x Stroke (in. ): 4.000 x 3.480, 333 HP @ 5100 RPM and 381 LB-FT @ 3700 RPM. TH700-R4 transmission with electronic toggle switch overdrive in an MD8 case. The casting number is 8663549 with serial number 1BBM075C. The serial number tells us a lot about this particular TH700-R4. 1BBM075C = 1(1991) BB(model or type of vehicle) M(700R4) 075(Julian date, 75th day of the year) C(Built by the plant third shift crew). Normally between the letter “M” and the Julian date code "075" a serial number is found. If the transmission was rebuilt by GM then they grind off the serial number and replace it with a rebuild sticker attached elsewhere on the transmission. Since this transmission is missing the serial number we know that it has been rebuilt by GM. It is also possible that when the crate engine was ordered for this corvette, the transmission was purchased along with it at the same time and the two came together. When building a street rod your best bet is to find a TH700-R4 from 1989 or later as found on this corvette. These later transmissions have a larger input shaft, larger input sprag, a 10 vane pump, 30 splines, and an updated gear train. I do not know which model of GM vehicle the “BB” code above includes. A wild guess would be a 1991 Caprice or Impala with a 305ci. Rear end casting: AM 6 5 65 = AM(3.36:1 Positraction) 6 5 65(June 5, 1965). Harrison aluminum coolant expansion tank 3155416 67C = Tank has the correct 3155416 part number, 67 C = The "67" is the year and "C" is the third month of the year so the expansion tank was made in March of 1967. Power steering which was only available on 250, 300, and 350hp engines only. TRW Fiberglass Mono Leaf composite rear spring 315#. Bilstein B6 Heavy Duty monotube design, gas charged front & rear shocks. 17” Custom American Racing Torq-Thrust II one piece polished cast aluminum five spoke rims with black inside barrel. LS Exhaust manifold 3749965 LH1 GM = 250 to 300 HP 327ci with M35 Powerglide 1958 to 1963 corvette. RS Exhaust manifold 3750556 RH1 GM = 250 to 300 HP 327ci with M35 Powerglide 1958 to 1965 corvette. N14 Side Mount Exhaust System. FAST EZ-EFI Self Tuning fuel injection system SKU: 30226-KIT. Engine bay mounted fuel pressure gauge. Spectre Extraflow Red Air Cleaner 14" x 3" HPR Filter and valve cover breather. Delco Remy SI(System Integrated) alternator utilizing a 12 volt negative ground producing 63 Amps with casting number 1102908 and a date code of 9A19. The date indicates that this alternator was made on January 19th in either 1969 or 1979. Of course it could easily be a remanufactured core that was purchased yesterday at nearly any auto parts store and spent its prior life on any number of other GM vehicles. Alternator has an internal voltage regulator and is a one wire system(original wiring & external voltage regulator was left in place for easy reversal of this system). The dash instrument cluster consists of 11 gauges and/or indicators. Speedometer = 160 mph with no indication of kilometers per hour. Tachometer = 7000 rpm limit. 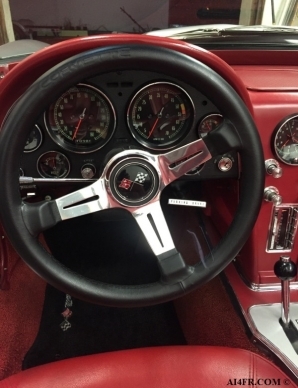 Since this corvette came with either the base 250hp engine or the L75 300hp engine the tach hits the orange zone at 5000rpm and starts to redline at 5300rpm and finally going past the redline limit at 5500rpm. Higher horsepower engines will reach both the orange and red zone marks at a higher rpm. The orange zone indicates the valve float area while the red zone indicates the maximum permitted rpm. Fuel gauge = Read from right to left such as "Empty l 1/2 l Full". When the ignition switch is turned off, the needle will not necessarily return to the empty mark. Ammeter = This gauge goes from -40 to +40 volts which shows the operator the condition of the charging system. Temperature gauge = This gauge in this corvette appears to be for a 66 or 67 model vette. The gauge has a 210 degree marking at TDC of the dial. For a 65 model it should have a 180 degree marking at TDC. According to the Chevrolet Technical Service Bulletin DR #774 dated November 23, 1964 owners were objecting to the 180 TDC gauge as harsh driving, excessive stop and go traffic, or prolong idling caused the needle to register at the upper part of the gauge. This positions the needle near the hot section of the gauge and had owners concerned even though the coolant temperature was within safe operating limits. The bulletin goes on to state that to satisfy any owner complaints of high gauge readings the 1966 model gauge should be used. Oil pressure gauge = Since this corvette came with either the base 250hp engine or the L75 300hp engine the oil pressure gauge reads only to 60psi. Higher horsepower models came with an 80psi oil pressure gauge. The gauge in the car featured on this page starts at zero on the left, then reads 30 at TDC, followed by 60 at the far right edge of the dial. Odometer = Five digit odometer with the highest mileage recorded being 99999. After the odometer reaches this point it flips around to 00000 and begins again. Trip odometer = Four digit trip odometer. The first digit on the right is for tenths of a mile. The three digits to the left of the tenths indicator is for miles. Once this odometer hits 9999 it spins around to 0000 and starts again. The operator can reset this counter at any time by way of an adjustment directly under the dash. Brake warning light = This indicator will light the word "BRAKE" in red to signal the operator that the parking brake is on when the ignition switch is turned on and the parking brake is engaged. Lights warning = A flashing red "LIGHTS" indicator gives warning whenever the headlights are turned on but are not fully open. High beam = A red high beam indicator lights to remind the operator that the high beams/brights are turned on. Power four wheel disc brakes. The 1965 Chevrolet corvette sales brochure called it "Sport-Master disc brakes" and "the greatest improvement in corvette braking since the inception of the stingray design". The brochure went on to say: "During maximum braking from higher speeds 65% of the braking action occurs at the front wheels, 35% at the rear wheels--to balance forward weight shift". Quad piston calipers with stainless steel sleeves. Typically, the manufacturer date of the glass is two to four months prior to the manufacturer date of the car. NCRS judging will give full credit for any date within one year prior to the assembly date of the car. Windshield notes: Called Pilkington at 1-800-848-1351 and talked with Randy. He was able to answer what the letter M is for and the DW636. He had no clue as to the rest. The AS-1 and DOT-177 was not discussed as these were known at the time of the call. I wonder if the “U J” marking could have been a guess by a former owner as to the correct date code on the glass. If so, the “U” would be for July and the “J” would be 1965. I would assume that if this was the case then a mistake was made or Pilkington did not have the correct date code as the “U” should have been an “I” for June instead. Typically a windshield is manufactured one to three months prior to the manufacturer date of the car. NCRS judging will give full credit for any date within one year prior to the assembly date of the car. 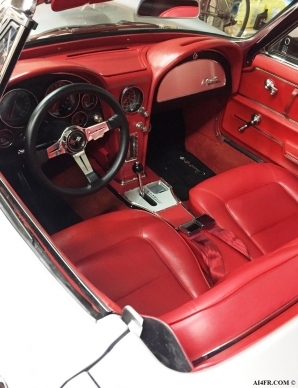 This corvette left the assembly line on Tuesday June 15th 1965 painted an Ermine white with red vinyl interior. It most likely had a 327 C.I. V8 engine with either the standard/base 250hp or the L75 300hp power plant. I place the Horsepower(hp) strength at either 250 or 300 due to the following clues: The tachometer redlining at 5300rpm(except for early production 350hp cars), the 60psi oil pressure gauge, power steering option(only available on 250, 300, and 350hp engines), and the automatic transmission option(only available on 250 or 300hp engines). Since this car is a somewhat late production car I can toss out the 350hp engine thus leaving either 250hp or 300hp. Of course anything could have been swapped out and changed or added in the last 50+ years but until I find another indicator the above two horsepower ratings seem to fit. 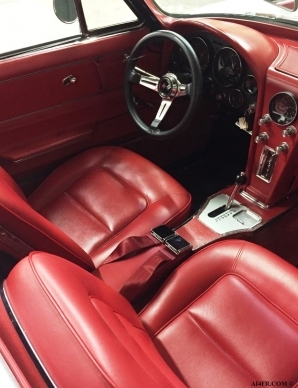 The 1965 corvette came standard with a 327ci, 250hp engine, 3 speed manual transmission, vinyl interior, and soft top(convertible) were all included in the base price. The M35 Powerglide automatic transmission came in a total of 2021 corvettes and of them, 663 had the 250hp engine while 1358 upgraded to the 300hp version. A total of 23,564 1965 corvettes were made and it appears only 2,549 had the 250hp engine while 8,358 had the 300hp engine which was a $52.65 upgrade. These production figures might be off by a total of 2 due to GM changing their records in March of 1991 when two additional corvettes were found to have been manufactured in August of 1965 and I do not know the details of these two cars. At some point this car was later painted red, but is now painted a Silver Pearl and has the correct red vinyl interior. These are the only body paint colors that I am aware of. A close inspection on the bottom of the radiator support shows slight traces of both the Ermine white and the red previous body paint colors. When the car sported its red coat, underneath the hood grilles were also painted red I believe. 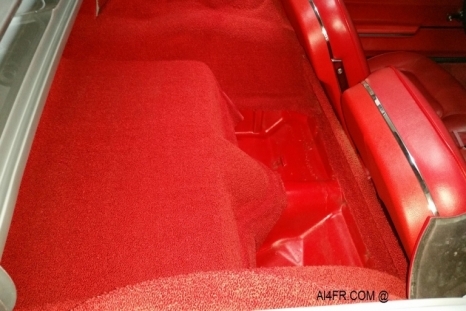 It's also possible that the engine compartment area was painted red as well. 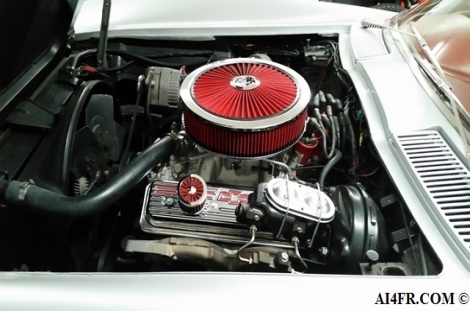 The corvette has a 1965 big block hood along with 17" American racing torq thrust II rims. It also has an aftermarket steering wheel and some upgrades to the suspension. As stated above, the body of this corvette was made by the A.O. Smith Company of Ionia MI. and all such A.O. Smith body cars did not come factory with the N14 side pipes. The A.O. Smith company did not have the tooling to cut notches in the outside edge of the left and right birdcage door sill rails for the side pipes. Plus the N14 side pipes were only available when ordered with a 4 speed manual transmission and an optional(higher HP) engine. Only 759 corvettes were produced in 1965 with the N14 side pipe option. The front grille is for a 1966 but it is my understanding that the 1966 grilles were a factory replacement for the 1965 corvettes if front end service was needed. Numerous 1965 corvettes have the 66 grilles. In fact, the 66 grilles are much more expensive to purchase today than the 65's. A 65 grille runs around $500 while the 66's are nearly twice that. I'm conflicted as to whether I should install a 65 grille. The 66 grille with the grey inside the egg crate pattern really looks awesome on the car with its silver pearl paint, it really flows nicely together. This corvette was born in June of 1965 and the 1966 models starting rolling down the assembly line in September of 1965. The car has the following options: U69 AM-FM Radio, Z01 Comfort and convenience Group, J50 Power Brakes, N40 Power Steering, N14 Side Mount Exhaust System, and G81 Positraction Rear Axle, K66 Transistor Ignition System. From the VIN(InstaVIN search) NCRS & other sources the following previous history has been uncovered. 6-15-1965 = Confirmed GM official production date. June 1965 = Shipped from factory to dealer Hicks Chevrolet at 5929 Georgia Ave. Washington DC (zone 14 / dealer code 250). June 1965 = Delivered by dealer to original owner. See DD stamp on VIN tag above. 8-24-2009 = Registered in New Jersey. 7-26-11 = Found a facebook post of the car. It is now in Illinois but not registered there. Color Silver Pearl(fresh paint). Car has BB hood, American racing rims, side pipes, reverse lights, corvette looks exactly as it does today except for the steering wheel. It is for sale by Heartland Classic Cars. https://www.facebook.com/168743626496974/photos/a.214685281902808.46336.168743626496974/223223881048948/?type=3&theater. I was informed by a prior owner that the car was restored by Heartland Classics in Newton IL. Heartland Classic cars does not keep any information concerning the autos they have sold. 3-21-2012 = Mileage 72240 according to the odometer disclosure when the owner in Vero Beach FL purchased it. 5-13-2014 = Mileage 10687 when Orlando FL owner purchased it. 5-14-2014 = Registered in Florida. Owner lived near Orlando FL. He installed the FAST EFI(electronic fuel injection) system, new battery, brake calipers with stainless steel sleeves and brake pads, power brake booster and master cylinder, brake lines, fiberglass mono-leaf rear spring, Rebuilt--rechromed right and left vent window frames and regulators, rebuilt both headlight motors. The corvette left this owner in better condition then when he purchased it. 6-15-2015 = Registered in Florida. I purchased it from this gentleman in Sarasota. Millage exempt on his title. I informed this owner that he registered the car in his name exactly 50 years to the day from when the car was born. He said "interesting" and that "he had no idea". 12-12-2016 = Registered in Florida. Mileage 10986 on title when I purchased it. State of Florida marked title milage as exempt since I had no way to verify actual milage at the time. In short, the car was built and sold in June of 1965. After that I have a huge gap in the history until it was registered in NJ in 2009 and has now been registered in FL since 2014. It has been driven a little over 300 miles since 5-13-2014 assuming that the odometer has worked. Original odometers seem to go out between 40k and 60k miles. Hence the reason so many 50+ year old C2 corvettes are seen with low mileage on them in and around this range. The 1965 corvette with VIN number 194675S119902 which is one earlier than the car featured on this page has been in Switzerland since the early 1980’s but now resides in Sweden. A corvette born on July 1st 1965 with VIN 194675S121328 was also sold by Hicks Chevrolet and now resides in Virginia USA. A corvette born on July 27th 1965 with VIN 194675S123197 was also sold by Hicks Chevrolet and now resides in the Netherlands. I bought the car pretty much sight unseen so I had it inspected by C&S Corvettes in Sarasota FL. before I made the purchase. The owner of the corvette mentioned the owner of C&S by name and recommended this company. The owner even offered to take the car there for the evaluation since it was just a few blocks up the street from where the car was stored. At this time all I had seen of the car was several pictures so I was placing my trust in C&S Corvettes for their evaluation since I live in another part of the state. Afterall, they are a corvette shop. I informed them by phone that I live several counties away and that I am unable to walk and am in a wheelchair and I needed them to be my legs. I hired them to do the inspection that I was physically unable to properly do. I was counting on this inspection to give an accurate assessment of the car. This inspection was the deal breaker if the car had too many issues or problems. Their evaluation of the car ended with the following comment: "Overall, an exceptional car that surpasses the condition of most cars of this vintage that we have seen." To review their full report please CLICK HERE. I have dreamed of this day for 36+ years, ever since first laying eyes on one as a young child. But family, obligations, and life in general are more important than a childhood wish so I waited and continued to dream. As time goes on, physical disabilities/injuries started cropping up which limited the choices or options a particular car must have. In my case for example the car must be an automatic as I can no longer push in the clutch with my left leg. It seems that most of these C2 corvettes came with manual transmissions so it became tough to find a C2 in automatic within our budget. But one day, and totally out of the blue, this one appeared un-expectantly. While not perfect, she’ll never be awarded a Bloomington Gold, NCRS top flight, or have a Triple Crown award, in my eyes she is awesome and a dream finally coming true. I live way out in the boonies. I might see another vehicle every 30 minutes or so on a busy day. For that first ride there were lots of emotions all rolled into one, nervous, scared, excited, anxious, and more. My first ride in the car consisted of a trip down a country road and back totaling 5 miles and all of it under 30 mph. As we were pulling out the driveway, and as luck would have it, we were met by another motorist. As the gentleman slowly drove by, he stuck his hand out the window and gave us a huge thumbs up. Wow, not even out of the driveway on our first ride and experiencing something like this is beyond my ability to describe it. That kind gesture by a stranger will be something that I will never forget. It also seems to prove the old adage true. “You’ll never get more smiles per mile than in a C2 Corvette”. Beside being owners, we are the caretakers of these pieces of history and all prior owners are a part of that history and should be kept with the car for future generations. I'm very interested in hearing from any prior owners. I'd love to receive copies of any pictures, documents, stories, or whatever you may have concerning this corvette. Please me. Thanks in advance. The dealership that sold the corvette featured on this page was called Hicks Chevrolet Inc. Hicks was located at 5929 Georgia Avenue NW, Washington, D.C. 20011. I was able to piece the following paragraph together from a 2010 post at the corvetteforum.com and a 2004 article by Jim Donnelly found at hemmings.com. R. Robert Hicks, was a regional manager for Chevrolet before World War II at a time when GM managers were moved around the country. Mr. Hicks lived in Buffalo, New Orleans and Baltimore before settling in Towson. He established a Chevrolet dealership and named it Hicks Chevrolet. The dealership was eventually sold to the Dworken family in 1965 but Mr. Hicks remained heavily involved in the industry. A lot of mechanics that worked at Hicks were hobbyist drag racers including the great Malcolm Durham. They raced at Capital Raceway Park and Aquasco Dragway. Malcolm later opened his own shop in Bladensburg, MD. Hicks Chevrolet received the very first 1963 Impala equipped with the Z-11 drag package to be delivered to the Washington, D.C., area. 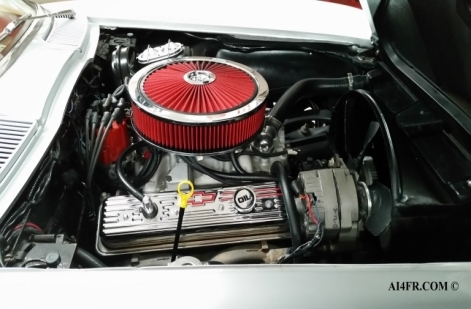 Chevrolet produced only about 100 of the cars, all equipped with the big-block that now displaced 427 cubic inches, topped with dual four-barrel carburetors, and conservatively rated at 430hp. Hicks Chevrolet was later renamed Curtis Chevrolet after the Dworken family took over and the Chevrolet dealer code changed from 250 to dealer 144. Wiki say it isn’t so... The Hicks dealership has been demolished to make way for a Walmart. The Brightwood Car House, at 5929 Georgia Avenue NW, was built in 1909 as a car barn and electric generation substation to replace a 'car stable' that burned down on January 16, 1898. It was designed by the engineer W.B. Upton who also designed the Eckington car barn. In 1955 PEPCO sold the car barn, and it ceased operation as a streetcar facility. It became the showroom and service center for Hicks Chevrolet which modified the facade. In 1976 the dealership was sold and became Curtis Chevrolet. Curtis Chevrolet closed on November 30, 2007, and was sold to Foulger-Pratt for redevelopment. Though the D.C. Historical Preservation Society asked Foulger-Pratt to reuse, not destroy, the car house, in 2010, Walmart announced that they planned to raze the car barn and build a store on the site, to open in 2012. Plans by Walmart to bring the entire structure down were approved and demolition began on September 6, 2011. Demolition was shortly thereafter halted for a historical preservation review, but historic designation was denied and the entire structure came down in March 2012. The Walmart opened on December 2, 2013. The new structure included bricks and trusses from the original car barn, which is all that remains of it. https://en.wikipedia.org/wiki/Streetcars_in_Washington,_D.C. If you are the owner of one of the Chevrolet Classic's below please me. I'd like to pass along to you some copies of documents, stories, pictures, etc.about these cars that you might be interested in. The cars played an important role in my life and slipped away decades ago. I miss them dearly and do hope that they have found a nice home. If by chance one is for sale please let me know. 1967 Chevrolet Camaro VIN 124377N130639 = Last seen with: 8cyl BB, PS, PB, PW, 4 speed, 2 carter carbs and very fast. 1967 Chevrolet Camaro VIN 123377N141656 = Last seen with: 6cyl, no power anything, 3 speed. 1980 Chevrolet Corvette VIN 1Z878AS402611 = Last seen with: 8cyl, PS, PB, PW, A/C, automatic.